Introducing technologies is one of the most common ways that agricultural research and development organizations assist the farmers they serve. The danger is that innovations are introduced without due attention to the demand side – paying insufficient attention to the actual problems faced by farming communities; their constraints and opportunities; and whether the new technologies actually match the local context. In the livestock sector, ILRI staff are often called on to advise smallholder livestock keepers on feed technologies. To ensure the relevance and quality of the advice we provide, we have started to develop a “discussion tool” to help us avoid ad hoc and narrow decision making processes. ‘TechFit’ is designed to bridge the space between rural communities and technology developers. 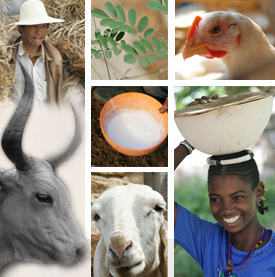 It has been developed by ILRI for animal feed interventions but can be adapted to other technologies. TechFit is designed to be a simple, practical discussion tool that non-experts can use to inform the selection of the most appropriate technologies in specific locations and contexts. TechFit supports decision making by systematising the way we collect, structure, screen and prioritise possible feed technologies and interventions using a set of general approaches, generic classifications and critical parameters from multiple angles (technical, institutional, policy, social and economic). We expect to use the tool in situations where livestock has already been prioritized as a promising livelihood option, and where feed is identified as the most pressing constraint to address. A related Feed Assessment Tool (FEAST) can be used to identify these situations and potential interventions. More information about FEAST is at https://fodderadoption.wordpress.com/feast. To deploy the tool, development and extension workers together with researchers facilitate a participatory process involving members of the local community during which information about the local situation is collected, scored and entered into a simple spreadsheet. Comparing the scores generated from the site with scores previously agreed by experts for the different feed technologies results in a shortlist of potential ‘best-fit technologies’ – those which most closely match the need for and availability of land, labour, cash, input delivery, and knowledge and skills. The short-listed technologies are then investigated more intensively using conventional action research approaches to ensure they are cost-effective and suited to the local agri-ecological and socio-economic context. TechFit has been trialled in a few situations and we are still refining the methodology. We welcome inputs, feedback and contributions from interested people.